Michael Douglas and Oliver Stone revisit Gordon Gekko in the long-awaited sequel, Wall Street: Money Never Sleeps. 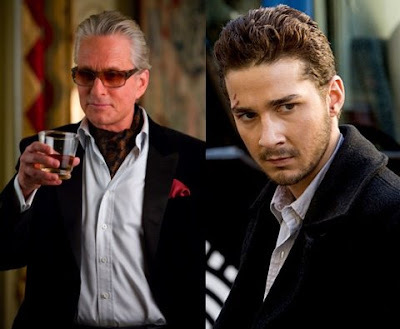 While it’s not the cultural touchstone its predecessor was, Money Never Sleeps is an enjoyable tale which brings Gekko into the 21st Century, replete with reptilian financiers who make him look like small change in comparison– and consequently, a more sympathetic character. It would be nice to say the recently released market master Gekko is the main player, but alas, this Wall Street has more players on its mind besides Gekko. The protagonist is really Jake, the requisite young, naive Wall Street hotshot (earnest and ultra-bland Shia LaBoeuf) who loves Gekko’s daughter Carey Mulligan, (who was wonderful in An Education—what happened?) while plotting revenge against the heartless capitalists (chief among them Josh Brolin) who conspired against his boss (Frank Langella), leading to financial ruin…and worse. Jake’s plans (love, vengeance) lead him to befriend Gekko, who has plans of his own, some of which include his estranged daughter. Will Jake get his revenge? Will Gekko reunite with his daughter? Will the market tumble again, despite Gekko’s warnings of impending disaster (the movie is set in 2008)? What do all the shots of those bubbles mean? (as if we didn’t know) And how does a guy like Jake become a Wall Street hotshot and be so naïve about a) money b) people c) motives d) all of the above? (And by the way, how did Gekko’s anti-capitalist daughter fall for Jake?) As with the first Wall Street, the young innocents are far less interesting (and plausible) than the venal financial masterminds whose machinations really run Wall Street, both in life and in the movie. Brolin brings a few layers to his villainous role until the script turns on him, while Langella does a fine job as an early victim of the bubble burst. But the movie really belongs to Douglas, who sinks his teeth into Gekko and makes him a little wiser, a little chastened, but still just as devilish—only with perhaps a little more heart. See it for Gekko.